The country's currency plummets over economic and political fears. Meanwhile, President Trump adds to the chaos. 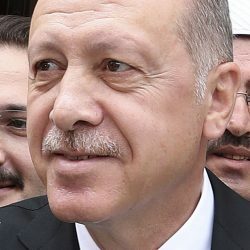 ANKARA, Turkey — A financial shockwave ripped through Turkey on Friday, when its currency nosedived on concerns about its economic policies and a dispute with the U.S., which President Trump stoked further with a promise to double tariffs on the NATO ally. A: Turkey’s economy has grown strongly in recent years, but that has required a lot of foreign investment and the country imports more than it exports. Together, that can weigh on the currency. As the currency weakens, it can make foreign investors pull their money out of Turkish stocks and bonds as their lira investments lose value. To do that, they have to sell lira – worsening the rout. The lira’s fall has been made worse by President Recep Tayyip Erdogan’s statements on economic policy. He has urged the central bank to not raise interest rates. Rate increases are the central bank’s main tool to support the currency and fight inflation. The central bank, officially independent, appears to have heeded Erdogan and has not raised rates when many – including the International Monetary Fund – said it should have. That drained investor confidence in the central bank, leading to a further sell-off of the currency. A: Turkey’s decision to jail a Protestant pastor from the U.S. has led to the U.S. imposing sanctions on two Turkish government ministers. Conservative evangelical Protestants are a key constituency at home for U.S. President Trump. The mere fact that the U.S. would impose sanctions on Turkey – a stalwart NATO ally for decades during the Cold War – has increased uncertainty about the future in Turkey. Trump raised the stakes on Friday when he said that his administration would double its tariffs on Turkish steel and aluminum. That caused a further drop in the lira. The U.S. was Turkey’s biggest export market for steel last year, though exports have fallen since. Europe is also dependent on Turkey to restrain the flow of migrants from conflict in the Middle East in return for aid. Some 4 million displaced people, most them from Syria, are currently living in Turkey. Any resumption of serious migrant flows from Turkey would be a big political issue in Europe, where opposition to immigration has fueled the rise of right-wing parties such as Itay’s League and the Alternative for Germany. The currency’s drop – 41 percent so far this year – is a gauge of fear over a country coming to terms with years of high debt, international concern over President Recep Tayyip Erdogan’s push to amass power, and a souring in relations with allies like the U.S. The diplomatic dispute with the U.S. was one of the triggers that turned market jitters into a full-blown rout this week. Turkey’s woes also shook world markets, pushing down stock indexes. The euro sagged to a 13-month low against the dollar on concerns that European banks operating in Turkey could suffer losses.